Home Page > Eat, Drink & Play > The Dish > The Dish! I'll cut to the chase: I'm a Nothing Bundt Cakes praise sharer. Ever since they saved the day two years ago (Kid birthday cake Pinterest fail. ), I've told everyone about how these beautiful bundts taste (Exquisite! ); how convenient they are (Multiple flavors are ready in a variety of sizes to-go, no order-ahead required.) and how well they are received (Guests, gift recipients and friends swoon. These are not your average cakes!). Even better, the staff is as sweet as the bundts they make from scratch daily with fresh eggs, real butter, real cream cheese and lots of love. Plus, the Valencia location is really a one-stop shop. Need a greeting card, a great gift and balloons to go with that slice of heaven? They have 'em, along with designer disposable plates, cutlery and more. Walk into the spacious, attractive bakery and five minutes later you can walk out with a complete party. But the real star of the show are the bundts themselves. Available in 10 flavors, two cake sizes, tiered cakes, bundtlet single servings and four-bite bundtinis (Like a cupcake, but cuter! 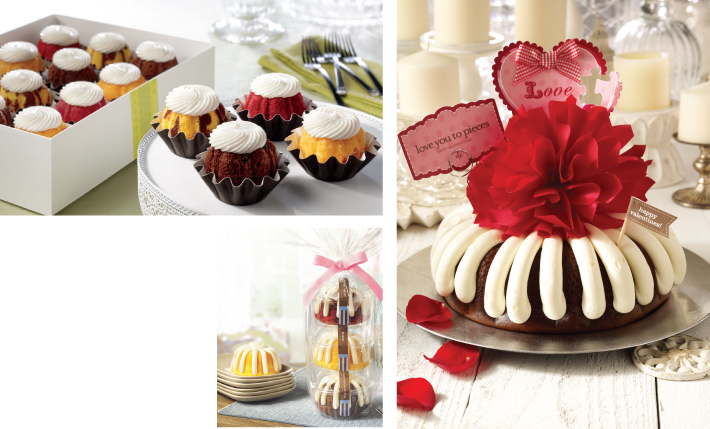 ), there's a bundt for every occasion. 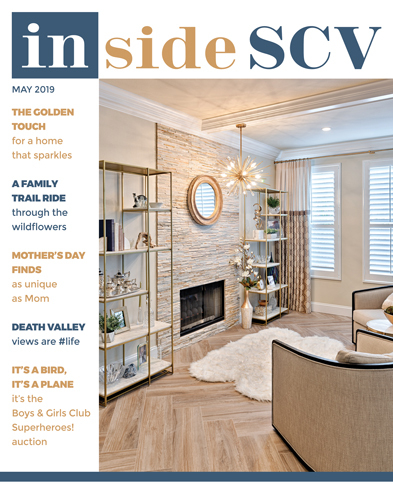 Those celebrating may want theirs dressed to the nines in luxe faux flowers or satin bows; princess parties call for crowned cakes; and Father's Day necessitates the Daddy-O design, complete with instructions and materials on how to make a paper boat. Of course, if the only thing your bundt is wearing are luxuriously-draped ribbons of Nothing Bundt Cakes' signature cream-cheese frosting, that's perfect, too. Nothing's smoother than the Nothing Bundt Cakes Red Velvet. A battered blend of gourmet cocoa and buttermilk, this Southern sweetheart is vibrant both in hue and in flavor, thanks in part to delectable bits of chocolate mixed throughout. The cream-cheese frosting adds a delicious tang, while the dense, moist crumb treats the tongue to a rich, silky texture bite after incredible bite. The best Valentine's gifts are rich - and you can say the same about desserts. That's why I already pre-ordered the Chocolate Chocolate Chip for an after-date dessert at home. I can't get enough of the decadent, home-baked flavor of this blissful bite that's packed with chocolate chips surrounded by a dark-chocolate cake batter. This not-too-sweet treat will go perfectly with a glass of my favorite red wine. My favorite Nothing Bundt Cake to nibble with a cup of tea is the lovely Lemon. Light, refreshing and delicately sweet, this beauty is ripe with the taste of freshly-squeezed lemon juice that's divinely balanced by the perfectly-paired frosting. I grab one in the bundtlet size, sneak it into the work fridge and tell myself that if I make it to 3pm in one piece, I get to have my (bundt) cake and eat it, too! on the way home to pick one up for the family to savor.